Yes, you have read correctly. Never despise the day you meet a chicken. 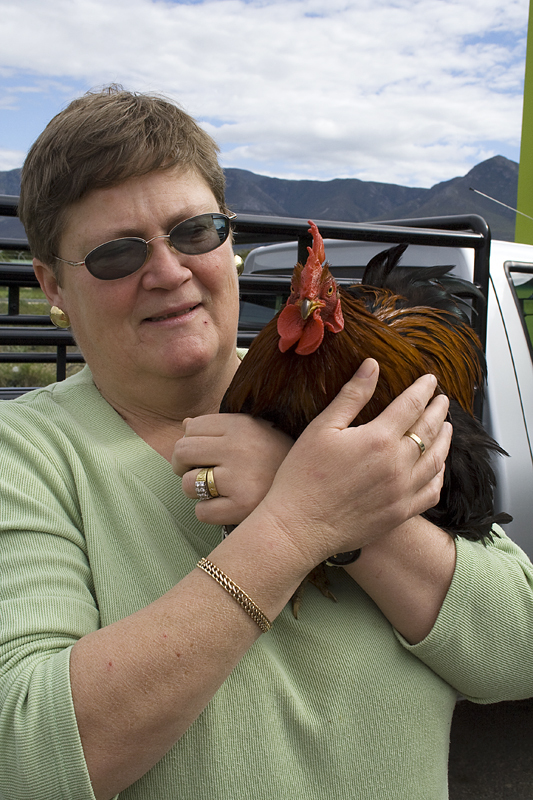 And more so when the chicken you meet is an avid tourist. 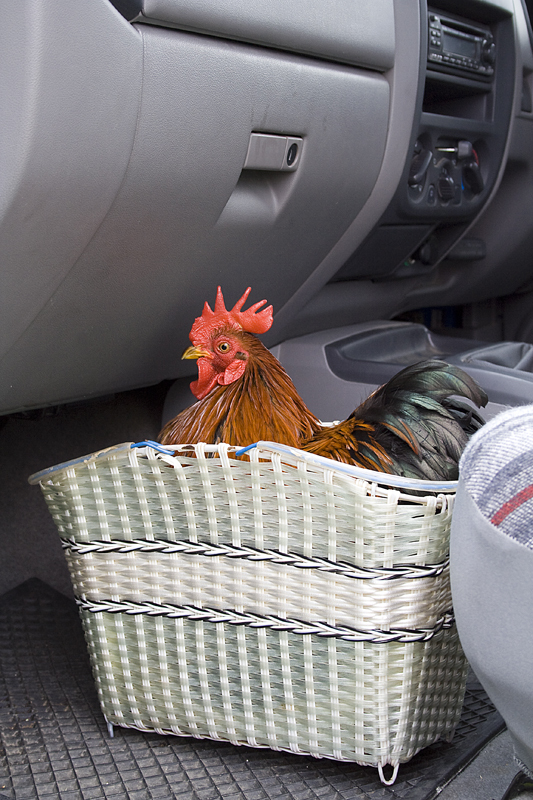 This one actually lived in Carnarvon in the Karoo, but I photographed him waiting for his human mom in his favourite vehicle outside Overberg Agri at Stanford on his way to his human parents’ holiday home at Uilenkraalsmond. Pikkeling (loosely translated as “Pecking thing”) was hatched by a pigeon and brought into the house by Stephen Hoffman. Initially, in winter, Stephen had to get up at three to replace the fledgling’s hotwater bottle. 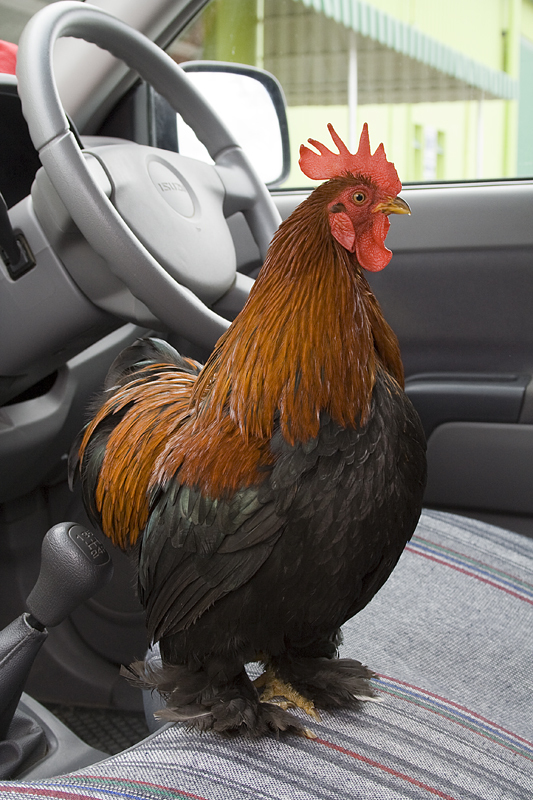 “He brought him into the house, so he had to get up,” said Stephen’s wife Lizette, who clearly adored the feathery cockerel. Pikkeling had even visited Cape Town, and had no problem travelling 220 kilometres in his little box at the feet of his “parents”. At night he slept on the couple’s bedside table, after a snack of crisps. 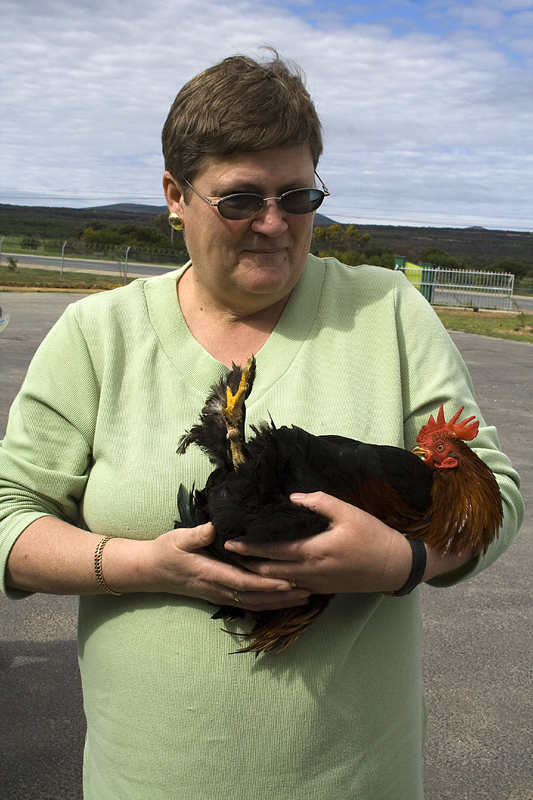 Then, wait for it, this little rooster from Carnarvon made it into a book! 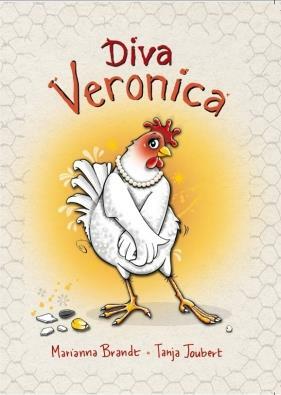 When children’s author Marianna Brandt started working on a book about Veronica, a real-life performing chicken, she happened upon our story about Pikkeling in Village Life magazine and promptly made him a character in her tale. Diva Veronica (161 pages) was published by Human & Rousseau. 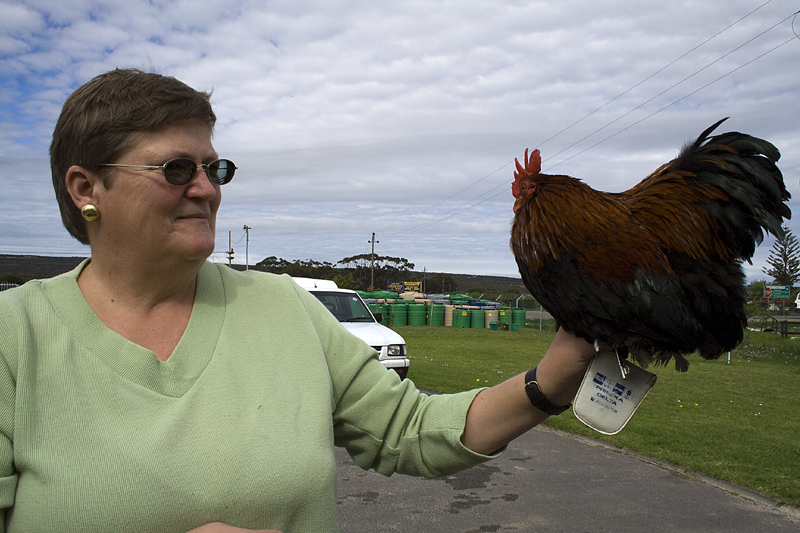 This is the story of Veronica, a little white hen that was bought at the roadside by well-known director and producer, Brett Bailey, to appear in his production of iMumbo Jumbo. Most of the friends Veronica made on her road (literally) to stardom, were real chickens: Parsons, Vernon, Herman, Pikkeling and Cornelia – the latter who also starred in the Bailey productions. Being a mixture of fact and fiction, this story is entertaining, but also quite informative. Not bad at all for a little rooster from the Karoo, I’d say! Pikkeling the baby in mom’s arms!